To townsfolk she was known as Libby Ellen but to members of the family she was Auntie Lizzie. 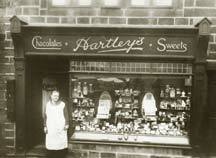 Many older readers will have happy memories of calling in at Libby Ellens sweet shop, Hartleys, at West End, Hebden Bridge, a magnet for sweet-toothed youngsters and adults alike. Great nephew Reggie Marsland, now living in Halifax, recalls gorging on gob-stoppers, liquorice sticks, dolly mixtures and aniseed balls. The shop was going strong in the 1920s and 30s, he believes, but may not have survived the Second World War when sweets were on ration. Hartleys, pictured above with Libby Ellen in the doorway, is now Ryburne and Co Estate Agents, who took over the premises in the 1980s. Leading independents in the Upper Calder Valley, the company is run by Margaret Ashworth, Simon Waring and Linda Shaw, who recently refurbished the attractive, cottage-style building, believed to date from the 18th century and amongst the oldest properties in Hebden Bridge.